We woke up at five to pack up, walk to the metro, take the metro to the dock, buy ferry tickets and board before our departure from Athens to Santorini at 7:25 AM. It was advised to get Economy tickets and sit in any free seats until you got kicked out by someone who paid for a specific seat on the ferry. Luckily, we never got kicked out of our seats and despite a noisy Greek mother and son, the ferry ride was rather painless! It was probably the biggest boat I’ve ever been on and to someone who has never been on a cruise ship, I was amazed that there was a coffee shop, a fast food restaurant, sleeping cabins, and airline like seating. 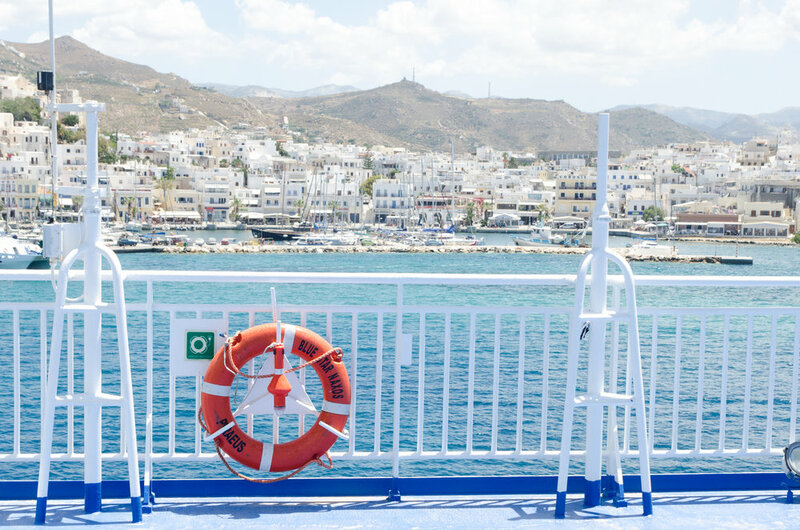 We went out to see the ferry landing at Naxos and then again to see part of Santorini before we had to get ready to dock and get off the ferry. It was beautiful and so much better than any plane ride would have been!